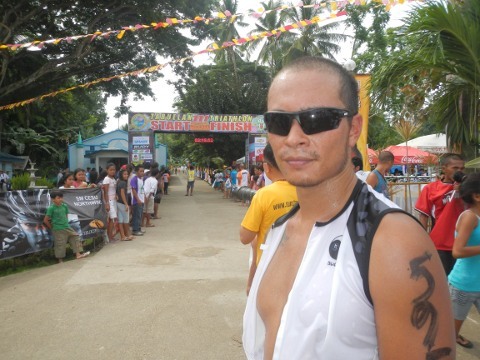 2nd place at Tabuelan 111 Triathlon (Cebu)! On June 16, 2013, I joined the third triathlon within 4 weeks after the Dipolog Centennial Triathlon on May 19 and the Triathlon in Jagna (Bohol) on May 25. 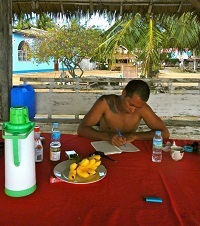 Some weeks ago, I had decided to join the Tabuelan 111 Triathlon in Cebu together with Jens from Bugoy Bikers – a preparation race for the Ironman 70.3 Cebu on August 4, 2013. With 2:35:02 h, I was only 58 seconds behind the winner Larry Bril who admitted that he had big problems on his last kilometer suffering from cramps in his legs; so I guess, only one kilometer more might have been enough to even finish 1st place, but I am actually more than happy with my race last Sunday. 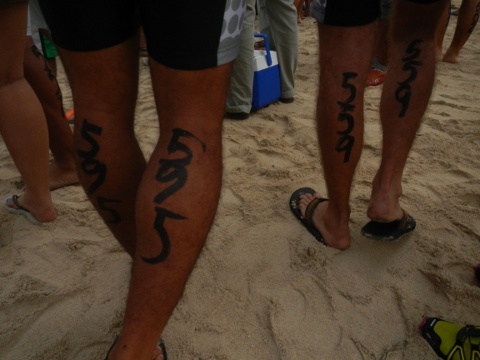 The race day itself was perfect for a triathlon in the Philippines with cloudy weather and a calm sea for the swim. We woke up around 4:15 AM after a short night, but we were able to catch up on some sleep and arrive at the site round 5 AM for the body marking. Jens started with no. 559, I got no. 595. The start was at 6:32 AM, and the swim started as a “run in the sea” because the water was a bit too shallow for swimming (at least for the first 100 m); some triathletes unfortunately stepped on sea urchins. During my swim-warm-up, I had already seen some of them and made sure to swim right away to not step on them and get hurt. I finished the 1 km in about 19 min which was ok, but I really have to improve my swimming skills for the next events. My bike ride with 1:24 h for 44 km was good, and I could not really cycle faster with the trekking bike. I was able to overtake some triathletes on nice road bikes and triathlon bikes and had only two more competitors in front of me during the run. I caught 3rd place finisher André Paquito Pacheo only a few hundred meters before the turning point and noticed shortly after that Larry was still a few minutes in the lead. For the next weeks, there is a half marathon participation planned here in Cebu City on July 7 where I finally want to break the 1:40 h. I will train at the same time for the Ironman 70.3 Cebu on August 4, though I am not sure if I can still join the event (still on the waiting list and still no racing bike yet). For the next months, there are some other nice triathlon events waiting like the DEFY 123 Triathlon Bohol (1 km, 110 km, 12 km) in October and probably the Boracay Triathlon Festival (3 km, 80 km, 20 km) in December; in January 2014, there might be my third marathon run here in Cebu City, where I want to make a sub 3:30 h after Munich 2011 (3:44:57 h) and Bad Füssing 2013 (3:36:37 h).